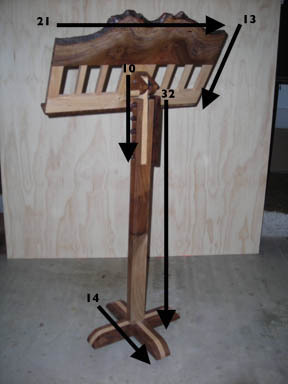 We've had multiple requests for a music stand plan and here it is! 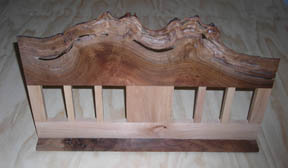 True to our form as beginning woodworkers, we don't have detailed drawings or CAD/CAM accuracy. But from these images, you should be able to gain enough insight on how we built our music stands that you can do it for yourself. 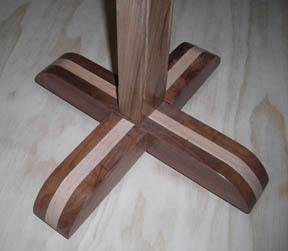 The finished height is determined by how the stand will be used. This particular stand is a good height for a seated musician. A singer, for instance, may require a taller stand. That would entail a longer main post and wider base. The top needn't be more than 1/2-inch thick. There really won't be a lot of weight to support (sheet music, etc). Keeping the thickness down also lightens the top and reduces the chance of tipping. We had some "live edge" walnut pieces lying around and put them to use. The yellow colored wood is pecan, a hardwood with decent workability. 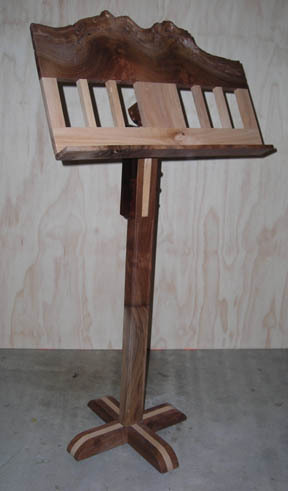 You can of course use what you like to build your music stand. The only metal hardware used is shown here. There is a hanger bolt tying the base to the main post and we prefer metal adjustable feet to felt pads. We found felt pads allowed too much sway. 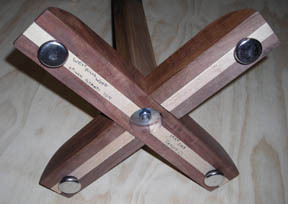 Our platform can be raised or lowered about five inches using this hole and pin arrangement, perhaps the trickiest part of this music stand plan. We milled the main post with a band saw to allow the adjusting post to fit. 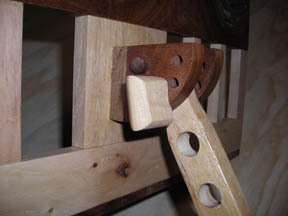 Dowels must reach all the way across the main post and extend about 3/4 of an inch to the opposite side. 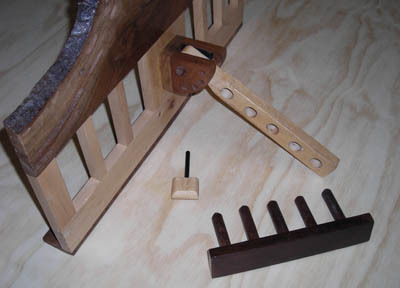 The top tilt mechanism is another hole and pin arrangement. We used a 1/8-inch metal rod threaded into a small piece of pecan for the pin. 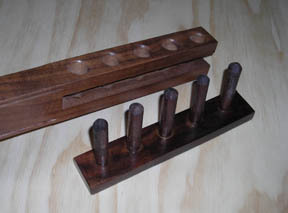 Set the holes at regular intervals from vertical to horizontal. Locate the top piece and tilt mechanism so as to keep the stand from becoming unstable in either position.